The Monarchs presents Imagine Too! 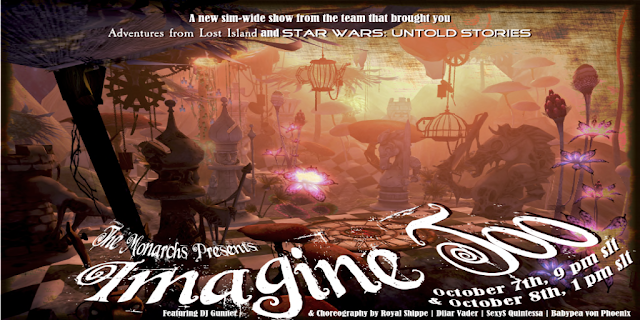 The sequel to last year's Imagine presents a series of performances guaranteed to awaken the child in you! At show time a special designed boat awaits your arrival, ready to take you across the sim from spectacle to spectacle - we highly recommend you arrive early to secure one of the limited seats on the boat. After the shows we welcome you to explore the sim and take advantage of the many photo opportunities. If you can't quite wait that long - fear not - the sim is already open and (almost) ready for you to venture into a world of magic and fantasy!